A few years ago, someone remarked to me how different his sons were. Both were early teens, both brown-haired, smart, athletic, both members of the basketball team. But when they played basketball, the oldest—I’ll call him Daniel—would score a bunch of points and also miss a shot or two, yet afterward, Daniel would talk about the shots he did not make, how he messed up, what he should have done. He didn’t mention all the great shots, the highs of the game, the wins. He remembered the misses. The other son—I’ll call him Mike—would score one or two points out of all the shots he made, but afterward, he would talk about those one or two fantastic shots, the best ones, and never mention the misses. He remembered how good it had felt to do something so well. He remembered, not the lows, but the highs. And who do you think was happier? It’s not hard to guess. When I heard this story, I thought about which kind of person I was, and I knew immediately: I was a Daniel, the one who focuses on the misses. And what I thought next was: I want to be like Mike, the one who focuses on the wins. That’s not to say there is something inherently wrong with each son’s way of behaving. Both boys were probably trying their hardest. One could argue that Daniel, focused on the failures, might have a better chance of making improvements by dissecting the misses. Sure, reflection and analyzation are good, but what I do is focus more on what should have been—even what might have been—instead of relishing the best parts of what is. I have been thinking a lot about this story over the last few months, as I’ve faced my own ups and downs, some tries and wins and losses. I have had to ask myself what kind of person I want to be. I have had to ask myself how I want to live. Recently I was visiting my hometown in Ohio, which is located in a part of the state particularly prone to grey from November through March. When I moved to the South many years ago and experienced my first sunny winter, I revelled in the light. But this year, for the first time, while out on a walk in Ohio, I looked up at the grey winter sky, and I thought about how I had never noticed its complexities before: the swirls of color, the changing texture, the marbled dark mixed with white. I had spent so many years hating the grey that I had missed out on its loveliness, its elegance. How easy it would be to see only the bleak and sad things in the world. How easy to miss the beautiful and the good. I don’t really do New Year’s resolutions. I do try and make changes, just not necessarily starting on January first. It’s been months now that I find myself more and more determined to focus on the positive. I hope it isn’t a goal for only 2018 but for life. This blog originally appeared in the Johnson City Press on January 14, 2018. In case you missed it . . . 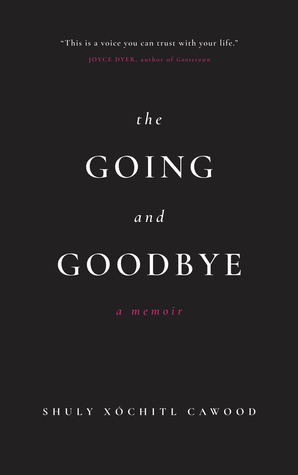 The Southern Literary Review spotlighted me in an author interview, and the Dayton Daily News listed The Going and Goodbye as a 2017 favorite nonfiction book. Read about all this here.